Comfortable first-class accommodations in a welcoming full service open atrium hotel. 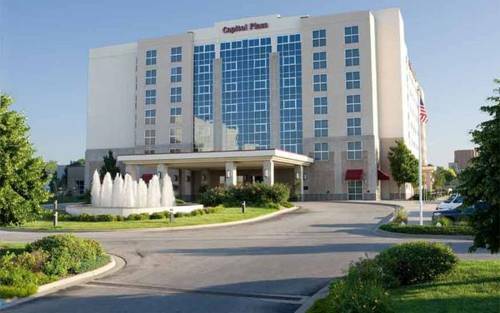 The Capitol Plaza Topeka is conveniently located adjacent to the Kansas Expocentre and just a few blocks from Washburn University and the Kansas State Capital Building. Indoor pool sauna hot tub fitness center business center Falling Water Grille Waters Edge Lounge complimentary parking. All reservations require a credit card to guarantee the reservation due at the time of booking. Cancellations must be made 24 hours prior to the day of arrival to avoid a penalty of one night room and tax. Exceptions may apply - please see rate rules. The monument actually honors the pig's human owner, Wilbur Chapman. Poor Pete the Pig is portrayed on its plaque, but has otherwise been forgotten. A giant "human hamster" treadmill is only one of many intriguing displays in a museum that shows how hard it is to make people sane.